Despite having to contend with deep budget cuts, schools are able to maintain current levels of technology growth, a surprising find from a recent survey by the Software & Information Industry Association. 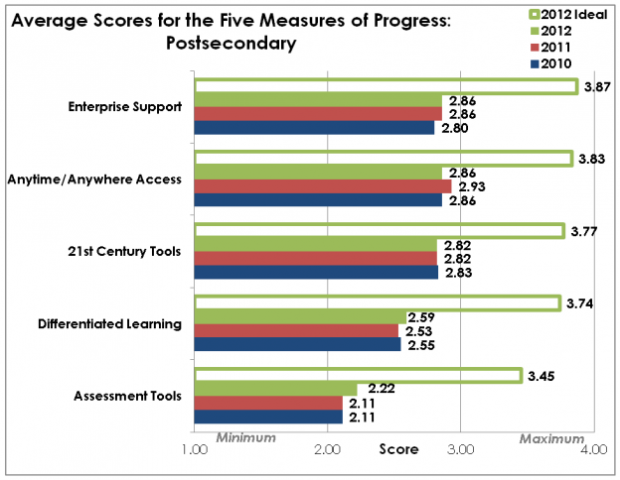 In its annual Vision K-20 Survey, which included 1,600 responders and comparisons over three years of data, SIIA found that education institutions are maintaining their level of investments in each of the five measures of progress: Enterprise Support, 21st Century Tools, Anytime/Anywhere Access, Differentiated Learning, and Assessment Tools. Although participants say current technology use lags behind their ideal level, schools are continuing to implement technology despite budget cuts. Some likely reasons: they're using existing technology; they're turning to free or inexpensive digital content and resources; they're redirecting funds from things like print materials for digital resources. Results showed an increase in technology integration that focuses on differentiated instruction, assessment tools, and information systems, suggesting these areas are priorities for schools. These include tools like learning management systems, online tutoring, online assessments, e-portfolios, and data-tracking systems. The survey items that are closest to ideal integration, including broadband and security systems, may suggest that school- and district- wide goals are more attainable than individual classroom goals, like new hardware. This supports the commonly held notion that district personnel have prioritized Internet access, student privacy, and security when making tech decisions. Overall, 24 percent of all participants report that their institutions are integrating technology at a high level. Courseware and/or learning management systems that are used to differentiate instruction (average 2.07 from 1.91). This confirms the recent interest and growth of adaptive curriculum tools that allow for personalized learning and instruction. Student information systems that track performance and institutional data for educational accountability and decision making (2.49, up from 2.35 in 2010). Institution leaders that use technology tools for planning, budgeting, and decision making (2.52 from 2.42). Technology-based assessments that measure a full range of 21st Century skills and knowledge (2.01 from 1.9). The survey also showed, for the fourth year in a row, a marked difference between K-12 and post-secondary institutions in the adoption of technology. The average scores for the 2012 survey were 2.39 for the K-12 segment and 2.71 for post-secondary (on a scale of 1-4), meaning post-secondary institutions are integrating new technologies faster then K-12 institutions. Security tools to protect student data and privacy. The availability of high-speed broadband access for robust communication, administrative, and instructional needs. 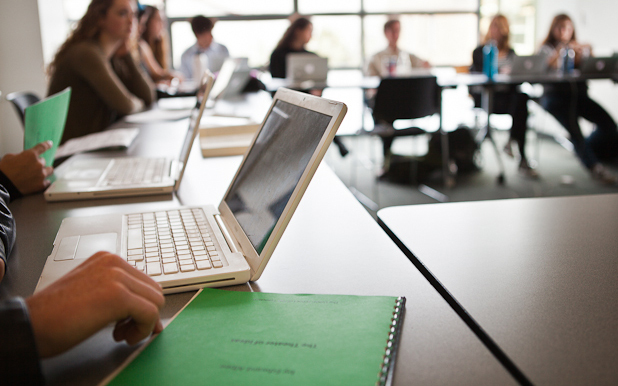 High-speed broadband access for instructional uses, including collaborative learning, video-based communication, and other multimedia-rich interactions. An institution website/portal provides the education community with access to applications, resources, and collaboration tools. This year, for the first time in the survey, participants were asked to respond to each of the questions based on both their current level and their ideal level of technology integration. For each of the measures of progress, survey participants rated their ideal implementation of each measure much higher than the current level. Overall, 75 percent of K-12 respondents chose the “highest” level of technology use as their ideal level. Responders this year indicated they appreciate the survey because it helps them see where their focus needs to be for the future of their institutions. Even with limited equipment and a lack of a technology budget, they think it's important to have a solid plan and informed priorities. That said, perhaps the true value of the survey is not in the resulting scores, but simply the planning support it gives to education institutions. Read the full Vision K-20 survey here.